Pokey Punch-out is a 4-player minigame in Mario Party 6. The background appears to be Shifting Sand Land from Super Mario 64. There are only aesthetic changes between daytime and nighttime. On the "Prickly Brawl" page in the game's Miracle Book, Waluigi and Koopa Kid are punching Pokeys. 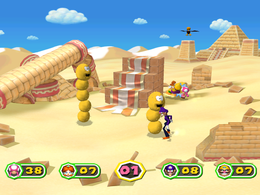 The players are standing in the middle of the desert. They are then shocked as several Pokeys emerge from the ground behind them. The player must punch the Pokeys' body segments by punching with or by kicking with and then while in midair pushing . To win, one must punch out more Pokey segments than anybody else. The player with the most points when time runs out wins. 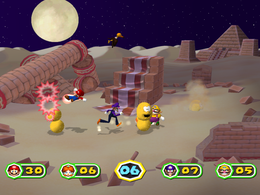 Players earn points by kicking out a Pokey's segments. Kicking out a Pokey's head destroys all its body segments at once, adding the appropriate amount to the player's score. Players can also stun each other by jumping and punching each other. This minigame appears as the sixth minigame in Decathalon Park. Here, the player's objective is to punch as many Pokey segments as possible to earn as much points as possible, up to a maximum of 1,000. The default record for this minigame in Decathalon Park is 15 points. Any Pokeys left on the field retract back into the ground. The winner does their victory animation, while the losers do their losing animations. Rules – "Punch and kick Pokeys that emerge from the sand to score points. Whoever scores the most points wins!" Advice – "Attack a Pokey's head to topple it completely and earn points for every one of its segments." This page was last edited on March 27, 2019, at 00:19.